FREETOWN, Sierra Leone – Fatmata Kamara, from Sierra Leone’s Kambia District, could not hide her surprise when she learned she would not have to bring candles or a torch to the clinic when she was ready to deliver her baby. Ms. Kamara, who was pregnant with her first child, remembered that candles and flashlights were necessary when her sister went into labour at night a few years earlier. Elizabeth Mansaray, the maternal health worker in charge of Bamoi health unit, pointed to the yellow ‘solar suitcase’ on the wall, which had been installed the previous week with assistance from UNFPA. “Now we have power during the night-time in the maternity room, so you do not have to worry about coming during the night for your delivery,” Ms. Mansaray explained. The solar suitcase contains two solar panels, which are mounted on a clinic’s roof and connected to high-quality LED lights. Fully charged, these panels can provide light for 18 to 20 hours. 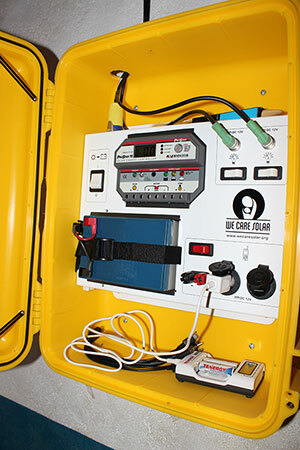 The suitcase also has headlamps, a foetal heart monitor and a unit for charging mobile phones. Ms. Mansaray recalled the “dark days” before the solar suitcase was installed. 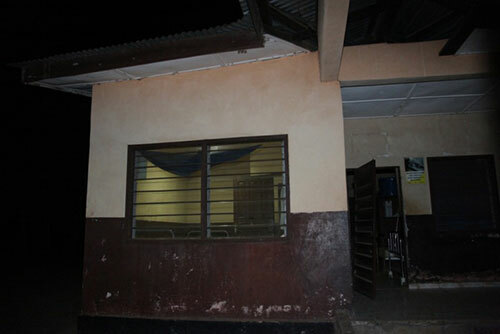 Like many health centres in Sierra Leone, Bamoi faced chronic power outages. Health workers were forced to use hand-held, battery-powered lanterns and flashlights when assisting night-time deliveries. Lack of power also prevented health staff from regularly charging their mobile phones, which meant that when complications arose, they had difficulty summoning an ambulance. Critical procedures were delayed, with sometimes fatal results. Ms. Kamara is all too familiar with this scenario. When her sister went into labour at night in 2009, their relatives were reluctant to bring her to the health unit. “We knew the [health unit] did not have any electricity, and we did not have enough money to buy a torch light. So we had to wait until my sister’s husband rushed back from his uncle’s home with some candles and a match box,” she told UNFPA. It soon became clear that her sister was experiencing labour complications, which the health workers were unable to address in the dark. “By the time we managed to light the candle properly, it was already too late, and we could not save my sister and her baby,” Ms. Kamara said. This story is a tragically common one. Sierra Leone’s maternal death rate has long been exacerbated by poor infrastructure. 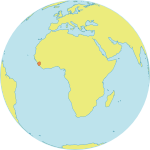 Some 1,100 Sierra Leonean women die per 100,000 live births, the highest maternal mortality rate in the world, according to the recent Trends in Maternal Mortality report. The solar suitcases aim to address these problems. The programme was brought to Sierra Leone by a former midwife, Isha Daramy Kabia, and the charity Friends of PCMH, who invited the maker of the solar suitcases, We Care Solar, to the country in January 2012. With support from UNFPA, the We Care Solar team trained local personnel to install and maintain an initial 18 suitcases, which were placed in health centres identified by the Ministry of Health and Sanitation. "The installation of the 18 suitcases [was] a major success," said Ratidzai Ndhlovu, who was UNFPA's representative in Sierra Leone at the time. UNFPA has since helped the Ministry of Health and Sanitation procure 42 more solar suitcases, which were installed in maternity rooms around the country with the funds from an H4+ Canada grant. "The installation of these solar suitcases has played a major role in helping to upgrade the health facilities in the country," said Minister of Health Miatta Kargbo. In many of the maternity wards where a suitcase has been installed, night-time deliveries have doubled. This means that more women are giving birth under safe conditions and with skilled care. The Kondembaia health unit, in Koinadugu District, received a suitcase in early 2012, for example. By the following year, the number of night-time deliveries had increased by roughly 300 per cent, said community health officer David Aruna. The suitcase also helped reduce maternal deaths in the area, he added. “Word about the solar suitcase has spread, and now women from neighbouring areas do not hesitate to come to our [health unit] during the night for delivery,” Mr. Aruna told UNFPA. Back in the Bamoi health unit, Ms. Kamara was visibly relieved to learn a solar suitcase would help her avoid her sister’s fate. “Now that I know the centre has power during night, I do not have to look for a torch light or candles this time, and don’t have to think twice about coming to the centre the moment I start experiencing labour pains,” she said. "I was not ready to lose my child"
This Update documents strategies, partnerships and projects for reducing maternal mortality and morbidity in the developing world. The State of the World’s Midwifery 2014 presents findings on midwifery from 73 low and middle-income countries.